Chiang Mai University Assoc. Prof. Virada Somsawasdi was honored as a “Woman of Courage” by U.S. Consul General Beatrice Camp in recognition of her courage and leadership in advancing women’s rights. 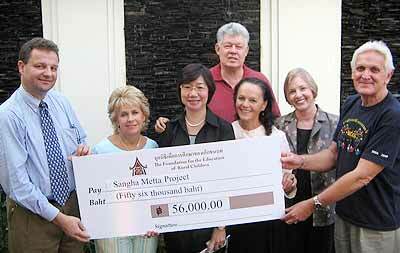 The ceremony was held on March 20 in Chiang Mai. Assoc. Prof. Virada was among women in 82 countries nominated by U.S. embassies for exceptional courage and leadership. She was selected for her sustained contributions to promoting the role of women in the political and economic process in Thailand and the region. As the founder of the Women’s Studies Center at Chiang Mai University and as the President of the Foundation for Women, Law and Rural Development, Assoc. Prof. Virada has helped develop the capacity of women in the region, helping advance their leadership role in government, politics, administration, and the economy. U.S. Secretary of State Condoleezza Rice, in honor of International Women’s Day 2007, established the annual Award for International Women of Courage to recognize women around the world who have shown exceptional courage and leadership in advocating for women’s rights and advancement. During the award ceremony, CG Camp praised Assoc. 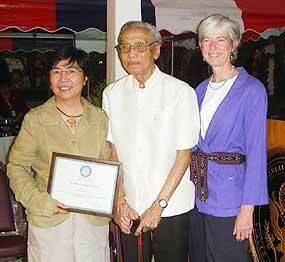 Prof. Virada’s leadership and contributions over many years to ensuring greater participation by women in the region. Christians Concerned for Burma invites the Chiang Mai community to participate in the third annual “Run for Relief” to help put a light on the situation in Myanmar and to emphasize the need for humanitarian relief. All funds raised are distributed in the forms of medicine, food, equipment, and educational materials supplied to ethnic relief teams who provide assistance to those who have been displaced. The 5 kilometer run/walk and a 100 meter kids’ dash sets off on April 28 with registration beginning at 7:00am. Location: Huay Tung Thao, Directions: drive north on Cholpratam Road (the big canal road west of town) toward the 700 Year Stadium. Continue on past the stadium for approximately 3 kilometers. Approximately 300 meters before the Cholpratam Road ends at the Mae Rim turn-off, turn left and cross a bridge. The parking lot where the race begins is the second right. Every Friday salsa lessons are available at 6.30 - 8.30 p.m. at the Chiang Mai University Faculty of Humanities, Building HB 7.